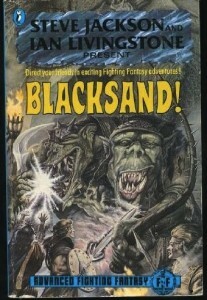 So I’ve ordered vintage copies of the old AFF books Blacksand! and Out Of The Pit, and they’re both on their way. 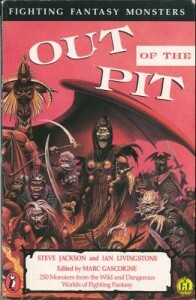 Part of me wanted to get the new printing of Out Of The Pit, but it was much more cost effective to snag an old copy, and since the new book is just a straight reprint. I’ve also read that the content from Blacksand! is due to be released by the new license holder eventually, but I didn’t feel like waiting. Anyway, I keep having ideas of things to do with the system, but I know that it’s way too simple & light for the folks I play with normally to want to sink their teeth into. But, like Barbarians of Lemuria, I think it’s a system that I can use as an inspirational tool even if I have to then take those inspirations and wrangle them into Basic RolePlaying. All that aside, I’m still entertaining notions of using AFF for some kind of online play or another. It strikes me as ideal for a good one- or two-player (plus GM) game. That is, having only three truly character-defining stats feels good for quick play with a small group, but even I can admit that for larger groups you’d run into folks feeling like their characters were all too much the same. But if you had one fight-y type and one magic-y type getting into trouble side-by-side, I think it would be aces. Brawler: This talent reduces the combat score penalty for fighting unarmed against an opponent armed with anything more than a dagger from -4 to -2. I’ve also got an idea for implementing a whole bunch of new talents based on the Martial Arts abilities in the old, ill-fated wuxia-meets-D&D game DragonFist to make AFF a solid engine for that kind of fighting. But I’ll save those thoughts for another time. I think the key thing I’m seeing/feeling here is that AFF is so delightfully light that (like other light games) it’s just begging to have stuff made up for it. Consider these new spells for the Minor Magic system as a great example. This entry was posted in Advanced Fighting Fantasy, Geek Materialism on January 3, 2012 by the venomous pao. I’ve been trolling back through some old stuff I played back in the 80’s. I think that Fighting Fantasy was underappreciated back in the rpg-detail-crazy 80s. It’s a nice simple system, it’d be great for something like play-by-post/forum gaming, too. And Happy New Year to you as well, G-Monk! I’ve downloaded the Fighting Fantazine issues and hope to check them out as time permits, but Warlock is news to me. I must now go on a mad hunt for this magazine! I think I’m more keen on trying to do some kind of video chat game (I hear Google+ works quite well for this sort of stuff) rather than a play-by-forum/play-by-email thing. The downside to that is, of course, the absurd time different between your fair city and mine. Still, it seems like there are a few windows where it might be possible. I’ll keep trying to wrap my head around the idea and I’ll let you know what I come up with, Gobbo. Oh, and just so it’s clear, my other G-named homies (G-Monk and G-Man) – and anybody else, for that matter – are in my evil plans as well. Now we’ll just have to see if I can put the plans into motion. No promises, but lots of hope! I’m totally down with that V.P.!! I’m technically challenged, but I’d figure it out, somehow. I was going to suggest the g brothers for a game. Although, frankly, we should get the g-man to DM games any chance we can. Or at least write ’em! I couldn’t agree more. On both fronts!